Ernest Taylor Pyle is a legend, known to millions as the most famous war correspondent of all time. Ernie Pyle loved soldiers, going the extra mile during World War II to tell their stories to the folks back home. He crisscrossed Europe covering events ranging from the London bombings to the American invasions of North Africa, Sicily and Italy, then back north to Normandy in 1944. Sixty-one years ago this week, Ernie Pyle lost his life on Okinawa’s Ie Island, killed by Japanese machine gun fire as he talked to a regimental combat commander. Ironically, military officials had thought the fighting was over on Ie Island, and were in Tegusugu, the island’s town, making plans for a next move. He was 45. Ever the quiet journalist, Ernie Pyle was born in Dana, Indiana. He served in the Navy Reserve during World War I, then went to Indiana University to become a journalist. He worked his way through a succession of small town newspaper jobs before moving up to the Scripps-Howard newspaper group, where Pyle wrote columns carried by more than 200 newspapers. World War II put the Bull Durham tobacco smoking writer in his element. He was one of the first to be embedded with a military unit, traveling into harm’s way alongside the soldiers themselves. London in 1940 was the setting for nightly bombings by German aviators, and Pyle was there. Across Europe, into Africa, and back to Italy and Sicily, Pyle chronicled the lives and exploits of everyday Americans fighting for their country. He told of heartache and hardship, writing hundreds of columns and stories about ordinary soldiers, sailors and airmen. Those articles were published as four books Ernie Pyle in England in 1941, Here Is Your War in 1943, Brave Men in 1944, and Last Chapter published in 1946 after his death. Pyle was an advocate for GI’s too, crusading in print to get combat soldiers “fighting pay” similar to the flight pay airmen were drawing. He got Congress’ attention, and a bill granting soldiers 50% combat pay was approved. 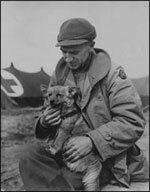 The bill was nicknamed ŒThe Ernie Pyle Bill’. From Europe, Pyle began combat reporting from Asia, working his way into the massive Battle of Okinawa planning. On April 18th, 1945, Pyle had just left the Army command post on Ie Island after talking with the general commanding Army troops, headed for the front lines. Traveling with Lieutenant Colonel Joseph Coolidge, the regimental commander, Pyle wanted to watch the action on the front lines. ”We were moving down the road in our jeep,” Col. Coolidge said later. ”Ernie was going to my new command post when we were fired on by a Jap machine gun on a ridge above us. We all jumped out of the jeep and dived into a roadside ditch.” Coolidge recounted “A little later Pyle and I raised up to look around. Pyle, who’s worst fear was always that “people will not like me”, is revered by thousands whose lives were touched by his war correspondent actions, and by the words he wrote. Today, a monument marks Ernie Pyle’s legacy on Ie Island. Visitors can make the easy trek from Motobu to the island by ferry from the port next so Sesoko Bridge in Motobu.